Located in a nature reserve nestling between the sea and a lake, the Grand Hotel Les Flamants Roses has a bright and spacious Thalassotherapy-spa centre and its own excellent restaurant, L'Horizon. 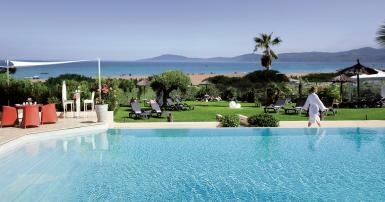 Overlooking the sea with the Pyrenees as a backdrop, its position is truly exceptional. In a subtle combination of charm and modernity, the Grand Hôtel Les Flamants Roses, which was renovated in 2015, offers a spacious interior that focuses on natural light and the sea. Its 63 rooms and suites offer an elegant combination of sophistication and modernity. These spacious rooms, which were renovated in 2015, open out on to beautiful terraces overlooking the Mediterranean Sea and the hotel gardens. A 1,200 sq. metre light-filled space for your relaxation and wellbeing. Our marine area has indoor and outdoor heated saltwater pools, jacuzzi, steam room and sauna. We also offer a range of body and beauty treatments, as well as full use of the gym. Our chef Sylvain Marsault offers delicious Mediterranean-inspired dishes. He has also devised an alternative, healthy menu that offers flavoursome yet light meals. Avis laissé le 21 2019 par O.
Avis laissé le 07 2019 par Nicola K.
I enjoyed my stay with the hotel. I found everything to be as I hoped. I had the time to relax and I found : Friendly staff Excellent food at breakfast and dinner Great location Great facilities Wonderful rooms I will return in April tariff permitting! Keep up the good work. Avis laissé le 22 2019 par B. A very nice stay! Thank you very much and see you again!